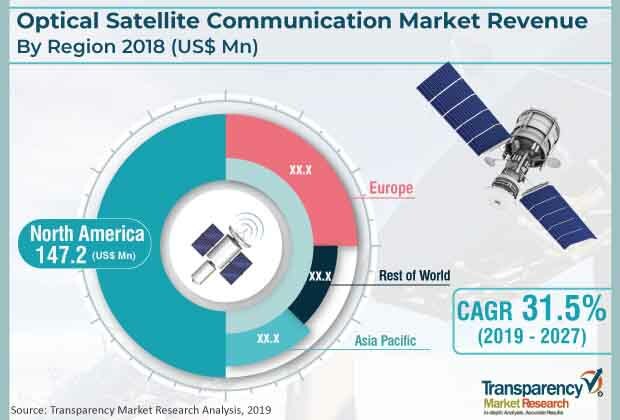 According to a new market report published by Transparency Market Research , the global optical satellite communication market is expected to reach a value of US$ 4,238.7 Mn by 2027, due to rising demand for high data rate. The market is projected to expand at a CAGR of 31.5% during the forecast period from 2019 to 2027. North America is expected to hold the dominant position in the market followed by Europe and Asia Pacific during the forecast period. Governments of various countries are investing in different optical communication projects to develop high data rate links. For instance, in 2018, NASA signed an agreement with BridgeSat Inc. to develop a space optical communication system for the agency. Similarly, The European Space Agency operates optical data relay services known as EDRS. The agency launched the Copernicus earth observation project with five LEO satellites, which offer optical communication for data transmission. In addition, various advantages such as huge modulation bandwidth, narrow beam divergence, less power and mass requirement, high directivity, unlicensed spectrum, and high security make optical satellite communication a promising candidate for next generation (5G) network as it requires high data rate (high speed and bandwidth capacity) which drives the need for high capacity backhaul links. The optical satellite communication market has been segmented based on component, application, and region. On the basis of component, the market is segmented into transmitter, receiver, modulator, demodulator, and others. According to the research, the transmitter segment held the dominant position in the market and is expected to retain its dominance throughout the forecast period. Increasing demand for high speed data transfer from satellite-to-ground is one of the major factors responsible for the expansion of the segment. High data rates have increased the demand for continuous R&D in optical satellite communication components. Based on application, the market is segmented into backhaul, surveillance and security, tracking and monitoring, earth observation, enterprise connectivity, last mile access, research and space exploration, telecommunication, and others.According to the research,the surveillance and security application held the dominant position in the market and is expected to retain its dominance throughout the forecast period. The high adoption of satellite technology by military and government security agencies for surveillance and security have accelerated the market in this application. For instance, according to Satellite Industry Association, in 2015, around 110 satellites were used for military surveillance operations, up from 101 satellites in 2014. The requirement for real-time data and high data rates have accelerated the demand for optical communication in surveillance and security applications. On the basis of region, the market has been segmented into North America, Europe, Asia Pacific, Middle East & Africa, and South America. North America held the dominant position in the market in 2017 and is expected to retain its dominance throughout the forecast period. The U.S. and Canada are the major driving engines of this region. High spending for space projects from government bodies of countries in North America is a major factor driving the market in the region. For instance, according to Space Foundation, in 2017, the U.S. accounted for 57% of global government space spending. In 2019, NASA's Laser Communication Relay Demonstration project plans to launch an optical data relay satellite system into the geostationary orbit. In addition, significant presence of market players in countries of North America is also a major reason for the dominant position of the region in the global market. The research study includes profiles of leading companies operating in the global optical satellite communication market. Key players profiled include Analytical Space Inc., ATLAS Space Operations, Inc., BridgeSat Inc., Hisdesat Servicios Estrategicos S.A., Maxar Technologies Ltd., Mitsubishi Electric Corporation, SITAEL S.p.A, Ball Aerospace & Technologies Corp., Mynaric AG, and Laser Light Communications Inc.